Small Drum Drills: 1-ee-and-uh - Best Drill Ever?! Designed to shake out the bugs lurking in taiko players' stick control and rhythmic understanding, the "1-ee-and-uh" drill drills into dexterity basics. Learn the 16 patterns that underlie most of the taiko music we play and the "truffle hunting" approach to uncovering and overcoming your weakest rhythms. 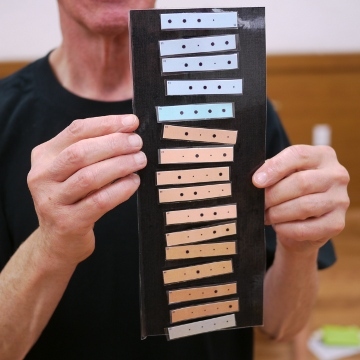 With before-and-after tests, the course aims to provide measurable improvement in four technical areas -- stick control, timing, improvisation, and the learning of new rhythms -- and teach a self-sympathetic approach to practice that is uplifting and effective.